Rimage’s exclusive thermal transfer technology is designed specifically for your CD printing. Whatever your application, there is a Rimage printer solution that will print your CDs faster, sharper, and more reliably than any other technology. Monochrome (red or black) ribbon-2,100 full CD images, or greater than 40,000* with ribbon saver. Special Features Ribbon Saver – Reduces ribbon waste by using only the amount needed for printing, lowering printing cost and maximizing throughput.Printhead Integrity Check – Automatically tests the printhead printing elements ensuring high quality images. Ribbon Validation – Monitors ribbon usage andindicates when ribbon capacity is running low. Prism Plus! – New printing algorithm allows for alower printstrobe setting, extending printhead life. Cleaning Mode – Allows you to quickly clean theentire printhead surface using the Prism cleaning pad. for custom labeling that prints high-resolution text and graphics directly on the surface of your CD-R or CD-ROM.What types of media can the CD Printer print on? results on smooth media that is neither porous nor ink jet printable. The best media are lacquer and thermal white coated.What kind of maintenance does the printer require? cleaning the print head with each new ribbon. The print head generally needs to be replaced every 10,000 full cd printings. What print ribbon do I use for lacquer, matte, or white-coated media? All of our print ribbons are multi-purpose. All you need to do is select the color.What ribbon colors are available? How many CDs can I print per ribbon? Approximately 2,100 to 40,000 CDs per single-color ribbon. The quantity will vary according to the size of what you are printing (because of the ribbon saving feature) on the CD, and whether you have selected single-pass or double-pass printing. What is the warranty on the printer? There is a 1 year warranty for standalone printers that includes depot repair, and the repair or replacement of any defective non-consumable parts. Upgrade to one year or a Rapid Exchange warranty. Call Rimage for pricing and details. What software programs are available to print labels? Rimage’s CD Designer is provided with the CD Printer and is designed specifically for creating label images. 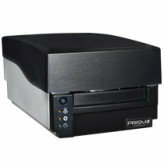 Also, the CD Printer Driver allows you to print labels that you create with any of your existing graphic applications. Does the printer work with a Unix, Macintosh, or IBM compatible? Everest II – Printed DVD Discs have bubbling on recording side – How to Fix. XP Pro SP1 FireWire Fix – Download and execute this file to fix FireWire Drives not being recognized in XP. AutoPrinter does not respond to Print Jobs or Buttons Pressed – How To Fix.